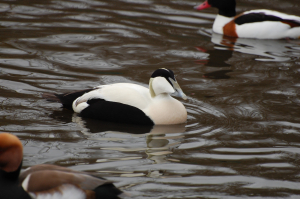 Observation - Eider - UK and Ireland. Description: Male black underparts, mainly white upper parts, except for black cap and lime green neck. Weird wedge shaped bill. Male black underparts, mainly white upper parts, except for black cap and lime green neck.